Steven Davies has revealed the debt of gratitude he owes Sheffield United’s hierarchy for enabling him to resurrect his partnership with Nigel Clough, writes James Shield. The centre-forward, signed on loan from Blackpool during the recent transfer window, made the admission after acknowledging he feared the opportunity to join the League One club would be wrecked by internal politics at Bloomfield Road where a series of behind-the-scenes incidents have culminated in their relegation from the Championship. Davies, who worked with Clough at Derby County before arriving in the North-West via Bristol City, told The Star: “Nigel has always shown great faith in me as a person and a manager. At Derby, he was kind enough to offer me a new deal and although I thought it was right, at that time, to move on he always kept in touch. “He knows my family and my kids. He’s a great guy. 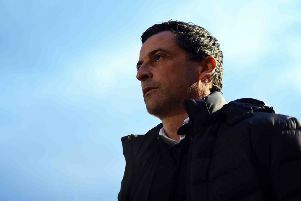 The protracted negotiations which finally delivered Davies to Bramall Lane proved an exercise in perseverance, perspiration and patience with the 27-year-old, having seen two previous agreements collapse, eventually forcing through the move following a summit meeting with manager Lee Clark. “All credit to (United’s managing director) Mal Brannigan too,” Davies added. “He worked his socks off to get the deal done because, as everyone knows, Blackpool aren’t the easiest club to do deals with. “There were numerous occasions when we thought we’d got over the line. Then it was all off again. Davies, speaking ahead of this afternoon’s game against Oldham Athletic, was referring to his goals against Barnsley and Doncaster Rovers which see Clough’s fifth placed side visit Boundary Park searching for a third straight win and having consolidated their grip on a play-off berth. “Character is something that the gaffer has always been big on,” Davies said. “He knows the type of lads he wants in his dressing room. “To be fair, I thought Doncaster were brilliant on Tuesday night. They’ve got some good players like Richie Wellens and James Coppinger. Davies, who has commanded transfer fees worth a total of £2m since turning professional, waited six matches before opening his United account at Oakwell a week ago. Nevertheless his delight has been tinged by recent events at his parent club where chairman Karl Oyston is embroiled in an acrimonious war of words with large sections of their support. “It was tough to see Blackpool go down,” Davies said. “Because I’ve got some great friends there.